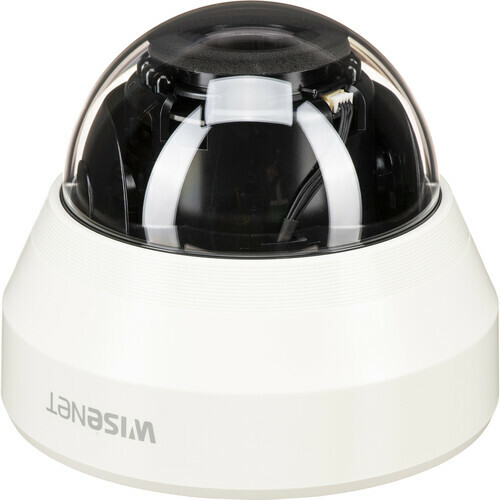 The ivory WiseNet HD+ 2MP Analog HD Outdoor Dome Camera from Hanwha Techwin features a 1/2.8" progressive scan CMOS sensor and 2.8-12mm manual varifocal lens for capturing videos at a maximum resolution of 1920 x 1080. This day/night camera provides 24-hour surveillance thanks to a removable IR cut filter and built-in IR LEDs with a range of up to 66'. Enclosed in an IP66- and IK10-rated housing, the camera can be used for both indoor and outdoor applications in areas at risk of vandalism. Box Dimensions (LxWxH) 6.4 x 6.4 x 5.3"